]. The plant is often grown as an ornamental. Seed - sow early spring in a greenhouse. Prick the seedlings out into individual pots once they are large enough to handle and grow them on in the greenhouse for their first winter. Plant out in late spring or early summer, after the last expected frosts. So far we have been unable to obtain seed from plants grown in this country. 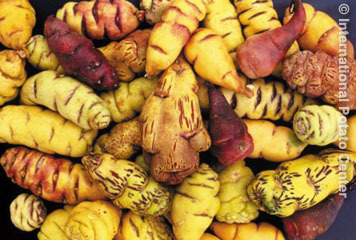 Division of the tubers in the autumn or spring. In cold winter areas the tubers can be harvested in the autumn after top-growth has died down and they can then be stored in a cool frost-free position until planting them out in the spring. ]. Pot them up into individual pots and place them in light shade in a frame until they are established. Plant out in early summer.